​and we'll come out to take a look . ​Our consultations are always free. Gutters and Downspouts - GTA Ontario Flat Roofers specializes in seamless aluminum gutters and downspouts. No fear, there are many options for colours and style to suit your home and your personal tastes. Seamless rain gutters perform a valuable but unseen service to your home over and above the obvious function of creating valleys for washing water away from the roof and the house. You wouldn't want water crashing down off every inch of the roof edge. So what is the primary benefit of properly installed seamless gutters and eaves? Take look at some of the benefits of today's eaves-troughs, gutters and down-spouts . New gutter colors are available and choices abound for complementing brick or siding colours. Curb appeal may be enhanced. Oversized downspouts are available where trees are adding to the waterfall and seasonal leaf shedding. Vented or solid soffit panels are available. We can advise your best bet for that. Protect your gutters from filling up with leaves and debris and install gutter guards knowing you won't need service for a long time. Gutter Guard including Installation is $6.00 /ft. ​Our aluminum specialist has been looking after gutters, drains, soffits since 1989. He take the opportunity to consult on all of your your aluminum gutter, soffit, and eaves needs and will show all of the available options and colours available with absolutely no obligation. Customer satisfaction is our primary concern so you will also receive a fully guaranteed job with warranty. One of the advantages of updating your gutters and eaves with the right products is that you will become maintenance free. 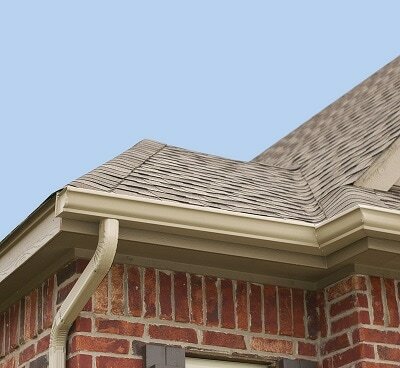 Adding gutter guards as well will have your gutters cleaning themselves. Believe in self cleaning gutters and you won't be sorry. The design of the gutters and covers actually force leaf and twig debris past the gutters and off the roof thus avoiding costly damage and repairs. An added benefit in northern climates is the reduction of ice and snow buildup in the gutters in turn reducing icicles and further allowing for expansion and contraction, the roof will never be damaged.